So I was feeling pretty good about myself having rescued the maple banister from disaster, or at the very least, expensive replacement. 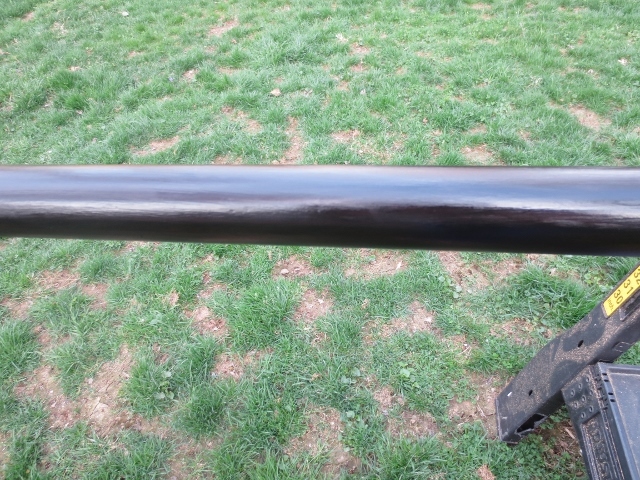 Since the trusty oak handrail had taken the Poly Shades stain pretty well the first time, I figured just a few more coats of that, and we would be good to go. But as Lee Corso would say, not so fast my friend! 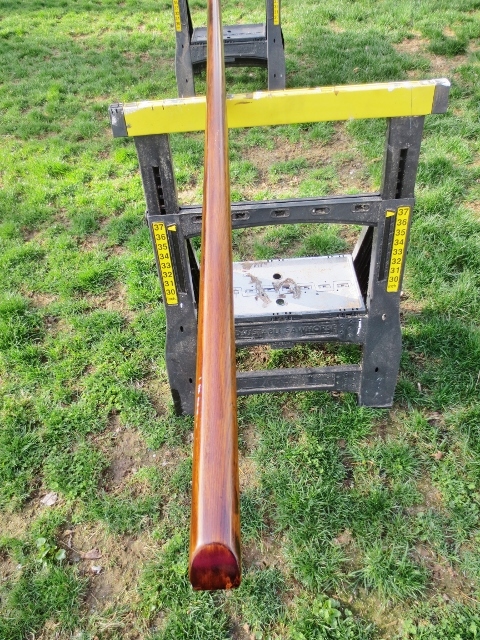 A few more coats of the poly shades and the handrail was still reddish with lots of wood grain showing through. It looked nothing like the banister. So I whipped out my sample can of Minwax stain in Jacobean since that was what did the trick on the banister, and gave that a try. What a mess! I think since the handrail is basically round, I couldn’t control the stain as well and it would run and pool and generally looked awful. Not to mention is was messy as all get out (which it really wasn’t when I did the banister, I didn’t have single issue with controlling the flow of the stain) and the wood grain was still showing through. 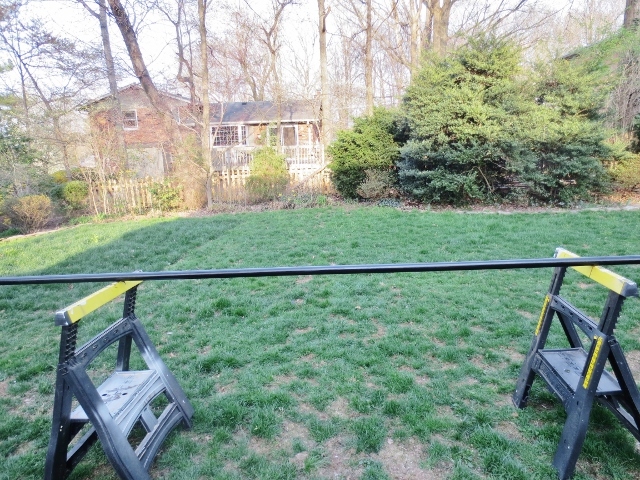 I tried this step over a weekend when it was fairly nice outside and I was able to set the hand rail up in the yard on saw horses and do my work. By the end of the weekend, as the failed stain attempt was curing and not yet dry, a storm moved into our region so I had to relocate the operation to the sun porch. By now we were running out of time to complete this project before my parents arrival, to say nothing of the fact that we had been living without a handrail for about a week. #safetylast. So one morning before work I decided to try another approach. I mixed a batch of roughly 2 parts stain with 1 part Poly Shades. My hope was the gel-like consistency of the Poly Shades would alleviate my consistency problem while still providing dark, solid cover to the wood. I mixed the batch in a plastic cup on the workbench in the garage and then brought it into the sun room and set it on the ironing board that I had in there for another project I’ve yet to tell you about. Under the ironing board and the saw horses with the handrail on top was a big canvas drop cloth. I have absolutely no idea how it happened, but as I reached for the foam brush in the cup of stain mix, somehow I pushed the cup over causing it to fall off the ironing board away from the drop cloth and spill stain all.over.the.new.sunroom.floor. pausing for dramatic effect, because believe you me, there was drama. You guys, the terror. I can still hardly talk about it. Without thinking, I ran to the kitchen and grabbed from the door of the refrigerator four bottles of water (two flat, two sparkling) and dumped them all over where the stain was. I guess my thought was to try and keep the stain from sinking in. Then I ran to the basement pantry where I keep a huge thing of baking soda and I dumped baking soda all over the liquid mess. Then I started grabbing towels and mopping everything up. Mind you, I am home alone, with the dogs at seven in the morning. The dogs thought I had lost my marbles and they were probably right. I started to calm down when, in the process of mopping up the liquid, I noticed that most of it was not sticking t0/staining the floor. In the places where I had manages to soak the stain with water right away, I was miraculously able to wipe most of the stain away. In the areas where stain had splattered or simply didn’t come right up when wiped, I grabbed a bottle of club soda, some more baking soda , and a magic eraser and went to work scrubbing. In about 45 minutes, I had managed to pretty much clean everything up and the floor appeared largely unhurt. I was so relieved. Still shaking, but relieved. Needless to say, that was the last time I tried to do anything indoors. I waited until the following weekend when it was warm and sunny out and continued my quest to ebonize this damn hand rail. After a coat of the stain/poly shades mix, I came to the realization that stain alone simply wasn’t going to produce the almost black look that the banister had. Time for plan D, or E, or Z, I am not sure at this point. This time I thinned a little bit of black paint and added it to some of the Poly Shades. Winner, winner, chicken dinner! 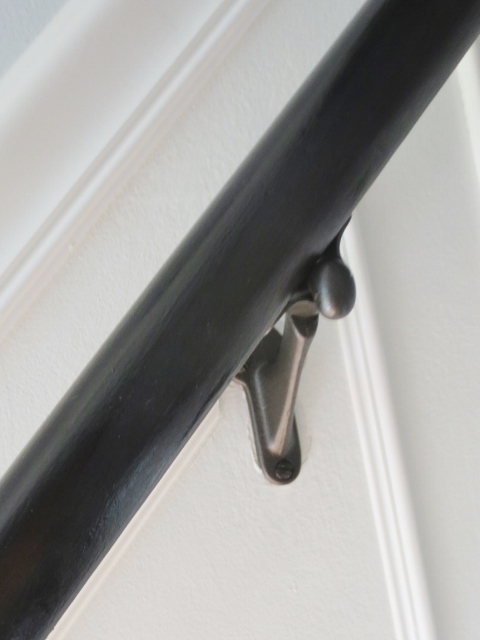 I finally got the dark, almost black look that the banister had. It only took me about 7 coats/tries, oh and my sanity. A small price to pay! Once the hand rail had completely dried. I added two thin coats of sealant. I recently bought this stuff because I read that it does not yellow over time and is eco-friendly. I also gave the existing hardware a couple of thin coats of oil rubbed bronze spray paint. I really don’t recommend you follow any of the steps that I have outlined in the last two posts. Best practices for DIY, they are not. But sometimes you just have to play the hand you’re dealt and luckily for us this time, it all worked out in the end. If I could go back and do it all over again, would I chose the same course? Oh hell no. But live and learn and move on to the next project. 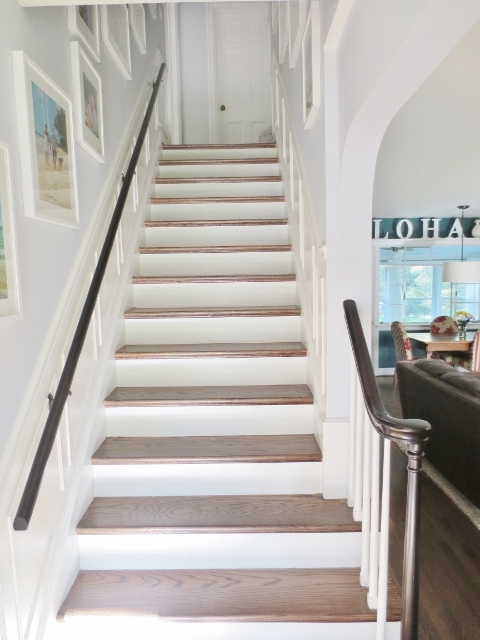 And so that’s the end of this story and the end of our stairway renovation project. We are still saving our pennies for some expensive finishing touches to the sun room, but I have a couple of other little projects to share with you in the coming weeks. Including why I had the ironing board in the sun room in the first place!